I've been working on this wall for about a week solid now. 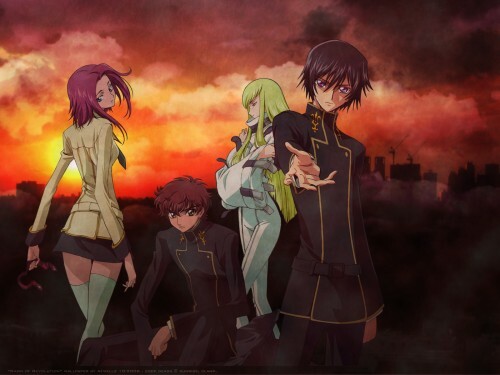 I think this anime, Code Geass, has potential, and I'm looking forward to seeing where they take the show. I wanted to do a group wall, and this image seemed particularly suited for one, but it was a bit challenge. If you take a look at the original scan, you'll see that the bottom half of all of the characters, especially Suzaku and Lelouch, are almost completely covered up by text. I repainted their bodies BY HAND in Photoshop. It was quite a challenge, but I think it came out well for the most part. The other half of the wall was my usual blending and painting that I enjoy. The city is of course Japan. Stock curtesy Stock Xchng. TV broadcast began and cannot assert, but it is the most interesting animation this year. Nice work! You did a good job of matching the scans color to match the evening sky. Good job! Code Geass is awesome. Thanks for the wp. A lovely wallpaper. I can tell you did a lot of work on it. The sunset goes really well with the title. I've never really heard of Code Geass, though I'm interested in it now, especially now that I've learned CLAMP did the character designs. this is an absolutely beautiful wallpaper. thanks so much. keep up the good work. i love the background. love codegeass. your wallpaper is pretty good too! This looks very very nice! The vectoring was great and the scene matches the scan. I really like the scan used. Hehe, good work! That looks brilliant! Code Geass is awesome ^_^ thanks for sharing! Oh this faces... Yes, its really nice. Thank you for shaaaaring! Wow, you made the picture a lot more solemn! Nice work!